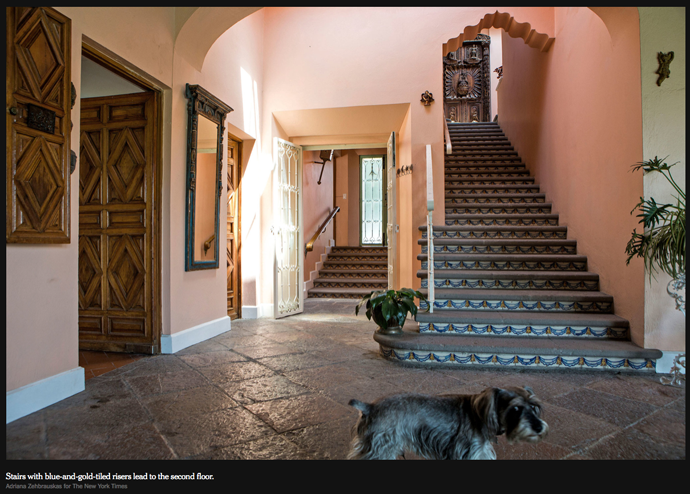 This nine-bedroom Mexican colonial home in Cuernavaca, Mexico, was created by one of the city’s most distinctive architectural designers, Rodolfo Ayala, in the late 1960s. 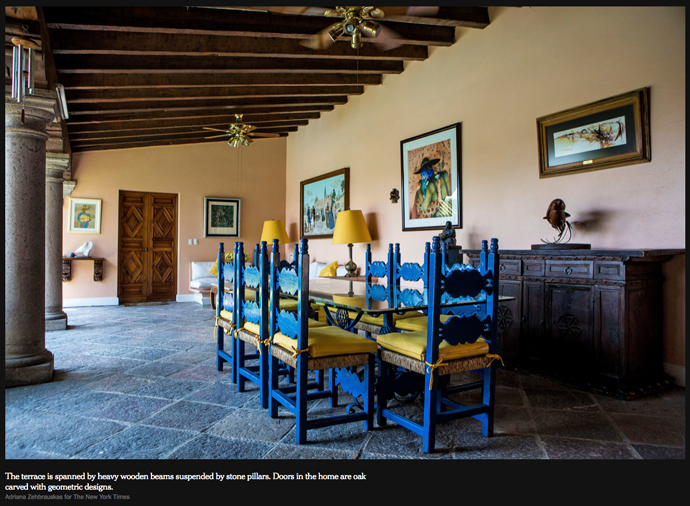 With a peach-colored exterior and candy-green accents, the rambling 7,860-square-foot home, called Mabruka, contains all the hallmarks of the Mexican colonial style, such as solid brick-and-cement walls, heavy wooden ceiling beams, arches, columns, terra-cotta, glazed tiles, hand-carved conch-shell niches, moldings and stone sculptures. 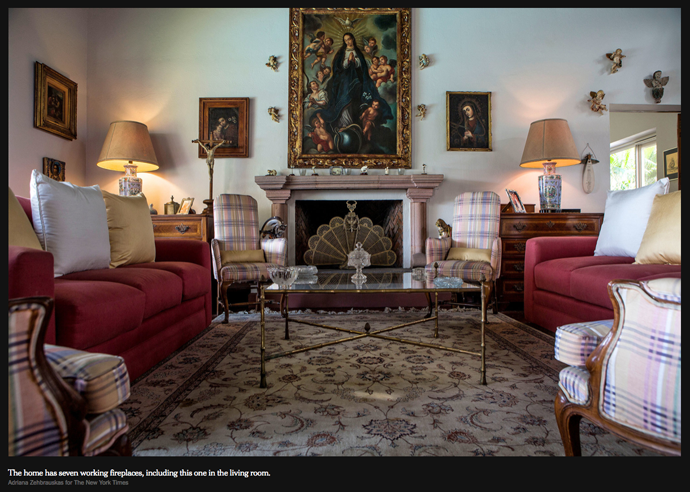 The two-story home also has some of the signature touches of Mr. Ayala, such as soaring ceilings and a copious use of skylights, said Andrea Dolch Espinosa de los Monteros, a partner at Barbara Waugh Propiedades, which has the listing. The beveled-glass front doors open to a short flight of steps descending to Mabruka’s main attraction, a spacious L-shaped terrace hugging a lush, split-level garden. The terrace, spanned by wooden beams suspended by gray stone pillars, has a powder room; a bar of white oak carved in geometric designs; a working fireplace of hand-carved stone; and several long, low built-in benches and tables. 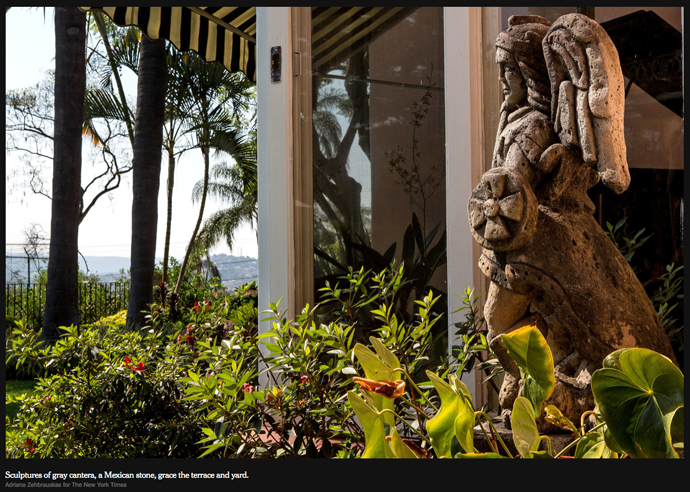 Sculptures of hard gray cantera, a Mexican stone, grace the terrace and the yard, which is landscaped with palm trees. 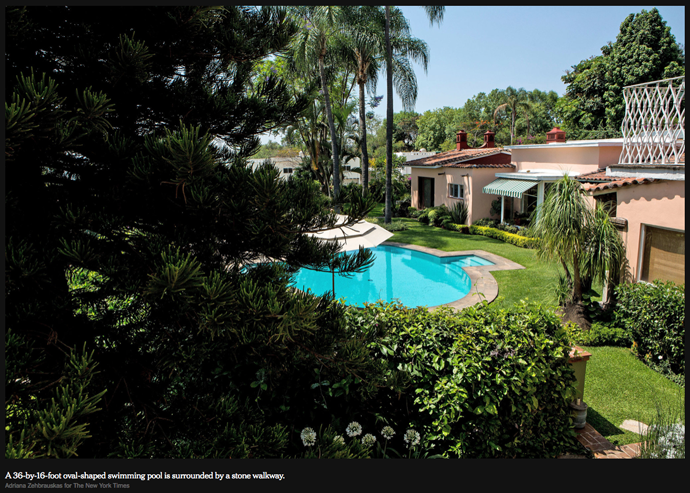 An oval-shaped, 36-by-16-foot swimming pool is surrounded by a stone walkway, said Javier Mariscal Vega, one of Mabruka’s owners. Off the terrace is a living room with an antique working fireplace and a bay window facing the garden. Four columns of hand-carved cantera bear a giant arch with a star skylight leading to the dining room, which also has round skylights of carved stone and recessed shelving topped with hand-carved conch shells. A bay window faces a small patio with a stone fountain. 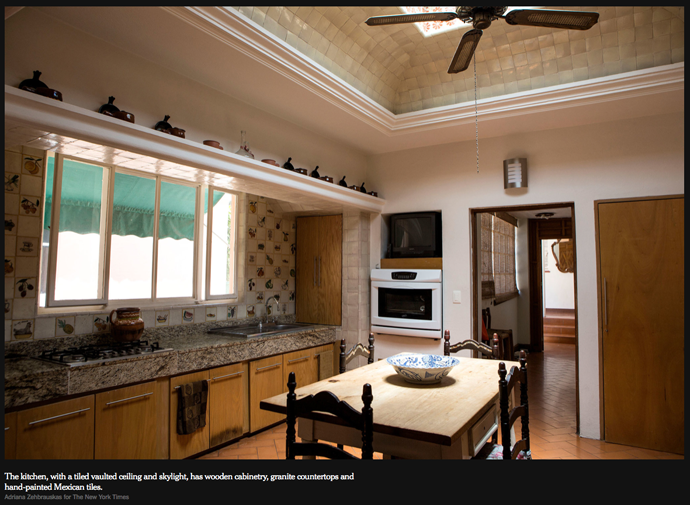 Abutting the dining room is a cavernous kitchen with a vaulted ceiling tiled in oyster white and a skylight, along with a butler’s kitchen. The updated kitchen has wooden cabinetry, granite countertops, and three types of original hand-painted Mexican tiles, Ms. Dolch said. Also on the ground floor is a library; the master bedroom with a working fireplace, terrace and master bathroom; and a second bedroom with bathroom and private terrace. 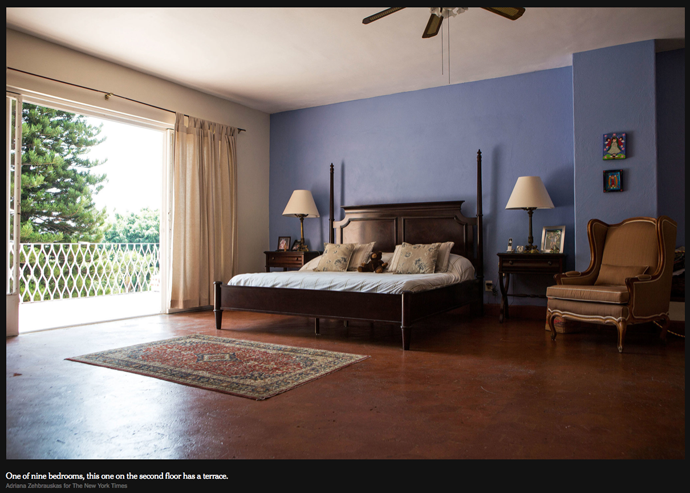 Most floors are terra-cotta or Saint Thomas marble, and doors are intricate hand-carved oak. Stairs with blue-and-gold tiled risers lead to the second floor, which has two bedrooms, one of which has a fireplace, sitting area and terrace. There is also a small kitchenette. In its service areas, Mabruka also has a total of five bedrooms, three bathrooms and a kitchen. 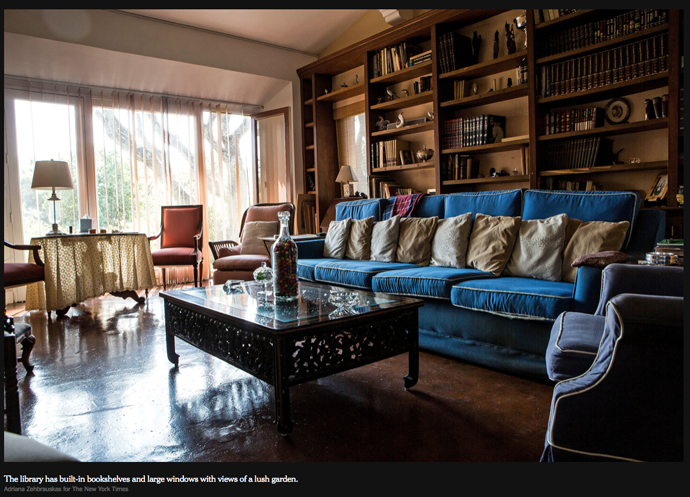 Mabruka is in the Palmira neighborhood in Cuernavaca, a city of about 350,000 people, 45 miles south of Mexico City. 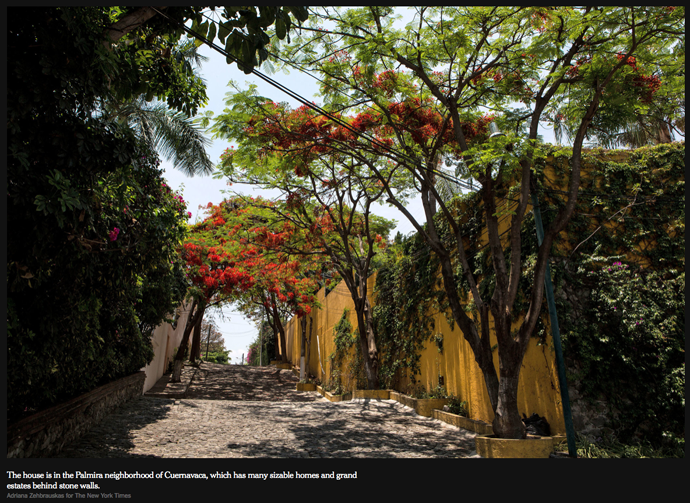 Palmira, which is about a five-minute drive from Cuernavaca’s center, is a largely residential area with sizable homes and grand estates behind solid stone walls, many of them on private streets. 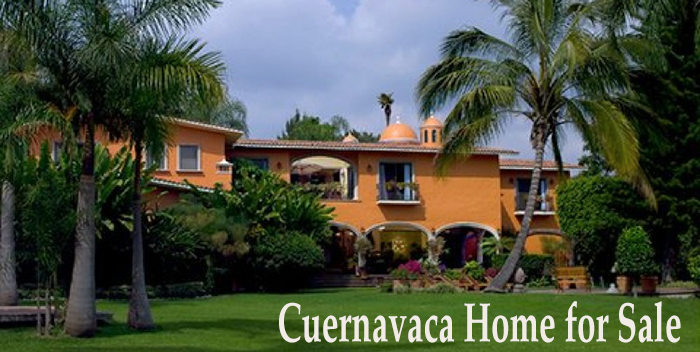 The city of Cuernavaca is highly popular with tourists, retirees and Spanish-language students because of its temperate weather and cultural and historic attractions. The drive to Mexico City’s international airport typically takes an hour to 90 minutes. Mexico’s housing market, which typically lags that of the United States by a few years, continues to stagnate after the global real estate crisis of 2008, while negative media attention about drug violence has also taken its toll, Ms. Dolch said. 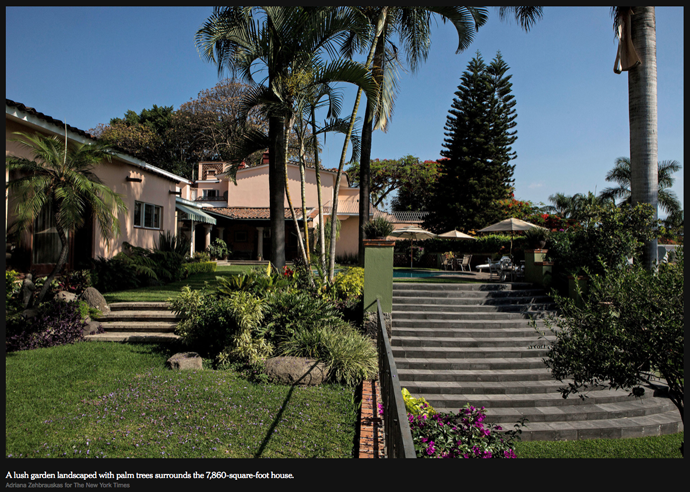 In particular, Cuernavaca’s luxury sector, which includes homes priced at about $750,000 to $10 million, saw prices fall roughly 20 percent in the mortgage crisis. Highly dependent on the United States economy, that sector continues to flag. There are recent signs that both the lower and higher ends of the housing market in Cuernavaca may be gaining traction, said Georgia Spencer, the owner-broker of Cuernavaca Real Estate. 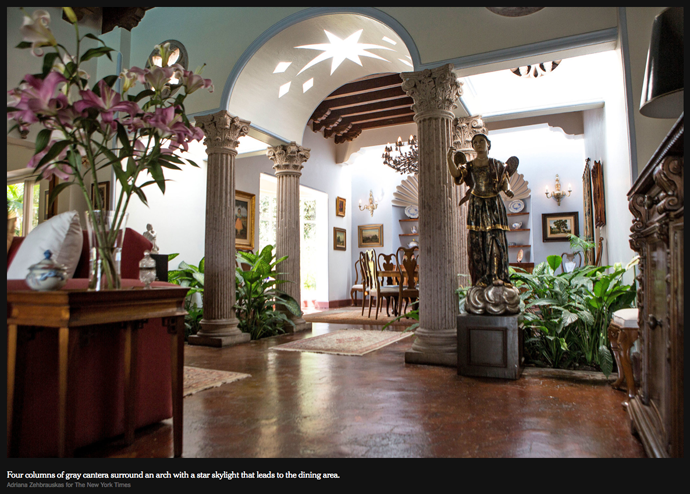 Cuernavaca, where Mexico City’s wealthy residents traditionally have second homes, was nicknamed the “city of the eternal spring” in the 19th century. For many decades, the city’s temperate climate and lush flora have attracted home buyers from the United States, Canada and Europe, though the global real estate crisis has thinned their ranks, Ms. Dolch said. Ms. Spencer said the most recent home buyers she has assisted were French, Venezuelan, American and Canadian. All foreign home buyers must obtain a permit from the Secretary of Exterior Relations, a one-day process that was recently made free, Ms. Spencer said. All property sales are handled by notaries in Mexico, which represent both buyer and seller, said Mr. Mariscal, an owner and a lawyer who works in a notary’s office. 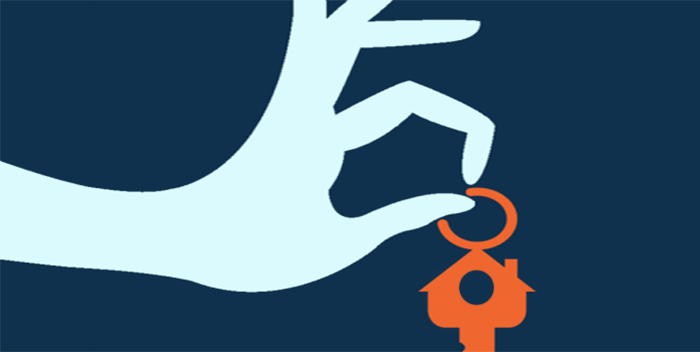 While a buyer may use a private lawyer, it is not necessary. Typically, buyers pay as much as 7 percent of the home’s sales price in municipal registration fees, notary fees and taxes, he said. The seller pays the real estate agent’s fee of about 5 percent. Mortgages are available to foreign buyers but are typically not desired, as they typically have higher interest rates of 10 to 12.65 percent, Ms. Spencer said. 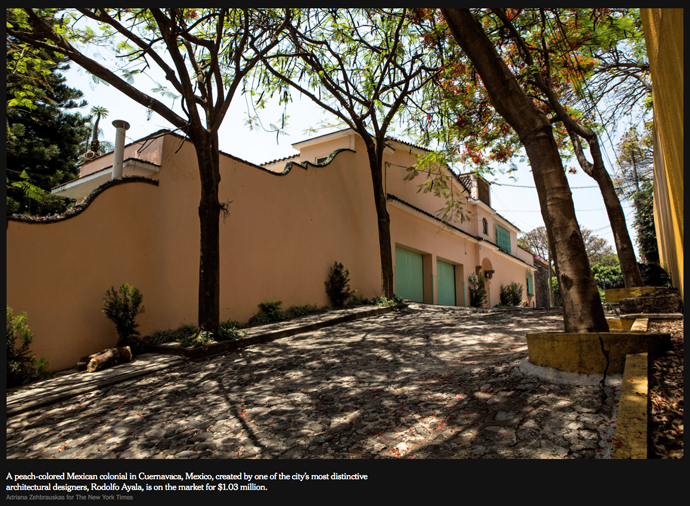 The annual property taxes on this home are about 5,000 pesos, or about $382, but that is likely to change with the home’s sale, Mr. Mariscal said.